TOYDIRECTORY > Randolph Rose Group, Inc.
About Randolph Rose Group, Inc.
Read Randolph Rose Group, Inc. Archives of Older Product Reviews by TDmonthly. Watch Randolph Rose Group, Inc. Archives of Older Product Videos by TDmonthly. 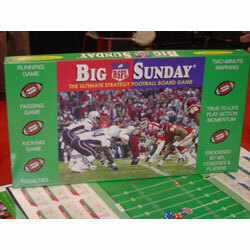 The Randolph Rose Group manufactures and wholesales Big Sunday Strategy Football Board Game. 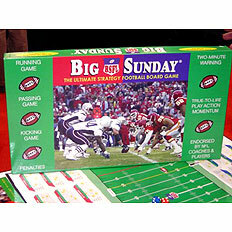 Big Sunday has been sold for the last eight years at www.bigsunday.com. 2006 marks the year we decided to wholesale Big Sunday to retailers, who can go to www.bigsunday.com/wholesale to order. Stay informed at www.bigsunday.com/press and www.bigsunday.com/tradeshows. 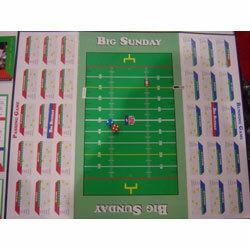 Big Sunday Strategy Football Board plays closer to real football than any other game. Running, Passing, Kicking, Penalties, Sacks, Interceptions, Fumbles, 2-minute Warning, 2 point conversion, bad call by officials flag picked up. You name it, Big Sunday has it, except audibles. For ages 7-adult. Endosed by NFL Coaches and Players. Case lots are six games each. terms are 30 days. Min order 1 case. Ask about our Frequent Buyer Program (FBP). Click here to see some of the products Randolph Rose Group, Inc. has shared with ToyDirectory and TDmonthly Magazine.